Microsoft C#.Net Tutorials: What We Need To Learn .NET? What We Need To Learn .NET? 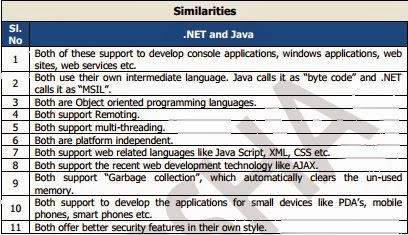 To get started with .NET Programming, the programmer must have previous knowledge in the following languages. Multiple platforms: The system runs on a broad range of computers, from servers and desktop machines, smart phones and cell phones. Industry standards: The system uses industry standard communication protocols, such as XML, HTTP, SOAP, and WSDL. Security: The system can provide a much safer execution environment, which can‘t be hacked or robbed by others. Supports multiple languages like VC#, VB.NET, VC++.NET, VJ#.NET etc., so that the programmer can write the code in his/her interested language. Offers more secured environment never before. Offers flexible data access with ADO.NET. Supports to develop windows services and web services, which are necessary to handle in the live projects in the modern programming world. Supports to develop applications for small devices like PDA‘s, smart phones, mobile phones etc. Offers ―> platform independency, because it supports to run the .NET applications on other platforms like UNIX, LINUX and Solaris etc., with .NET Mono framework. 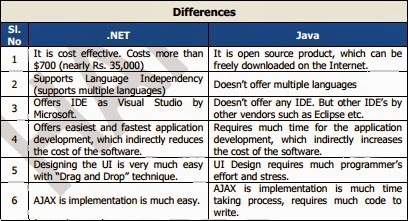 Offers easier and faster UI design (with drag and drop technique), when compared with the languages like Java. Offers the best debugging tools in the industry, which makes the programmer to easily fix the bugs. Offers improved object oriented programming features like properties, sealed classes, inner classes, delegates, enumerations, collections, interfaces, generics, extension methods, anonymous types, anonymous methods, lambda expressions, named parameters etc. Offers to share and reuse the code among multiple applications very easily, with the concept of ―> Assemblies. Offers to write queries in the programming code itself, using the newly added querying technology called ―> LINQ (Language Integrated Query), which is introduced in .NET 3.5. Offers faster and easier Deployment features, to generate ―Installer packages for installing the .NET application on the client systems. Offers to create multiple threads and also to manage them for creating Multi-Threaded Applications. Offers XML support and interaction, which is mostly required in the modern application development environment. Supports to create user defined graphics like lines, rectangles, bars, circles etc., very easily using “GDI+” (Graphics Device Interface) concepts. Offers a new and attractive feature called WPF (Windows Presentation Foundation), which is built on Vector based graphics and which enables the programmer to create 2-D and 3-D graphics, animations, games, audio and view players etc. This is newly added feature in .NET 3.0. Offers another prestigious feature called WCF (Windows Communication Foundation), which integrates the several distributed technologies like .NET Remoting, SOAP enabled web services, named pipes and message queues etc., which helps the programmer to develop service and network oriented applications using .NET. This is newly added feature in .NET 3.0. 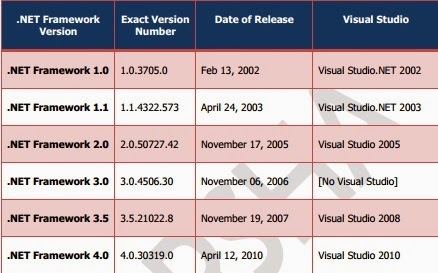 .NET Framework: This is the general version, required to run .NET applications on Windows operating system. .NET Mono Framework: This is required to run .NET applications on other operating systems like UNIX, LINUX and Solaris etc. .NET Compact Framework: This is required to run .NET applications on other devices like PDA (Personal Digital Assistants), Mobile phones and Smart phones.